Most fans of Japanese cinema should be familiar with Harakiri (1962), Masaki Kobayashi's classic tale of a ronin's revenge. Almost 50 years later, prolific director Takashi Miike---he of 13 Assassins and Ichi the Killer fame---has updated the film for modern audiences. 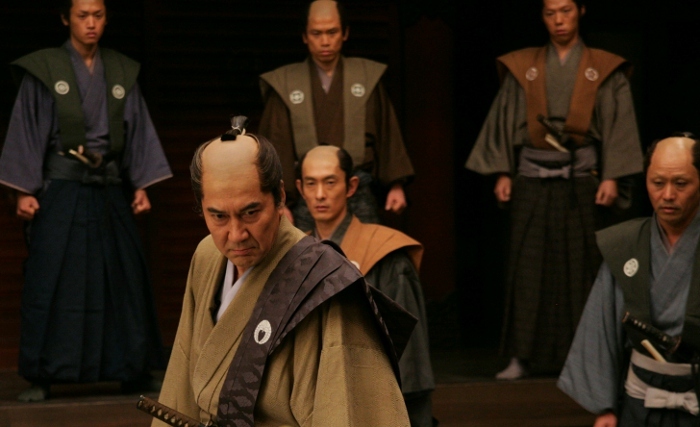 Though common sense would lead us to assume that Miike has infused Hara-Kiri: Death of a Samurai (2011) with an overcooked level of violence, this restrained remake plays like a slow-burning tribute to the original without feeling like a carbon copy. Our story follows Hanshirô Tsugumo, a ronin who now lives a quiet life raising his frail daughter and the young son of a deceased friend. She eventually marries at the request of Hanshirô, and it's not long before the family of three welcomes a fourth. Illness eventually cripples their small home and the child's severe condition requires a doctor's expensive care. With no money to his name, Hanshirô's son-in-law attempts a ritual suicide bluff at the nearby courtyard of a feudal lord: by threatening seppuku (stomach cutting), he hopes to get the money required to save his child. Unfortunately, things don't go as planned and Hanshirô quickly seeks revenge for the grave injustice brought upon his decimated family. Both the original Harakiri and its hyphened namesake share identical themes of tragedy, revenge and a subversive examination of "honor". Both versions employ frequent uses of flashback to reveal character relationships and subtle plot twists, and even several faces and camera angles are similar. But Hara-Kiri alters the ending somewhat without changing the film's overall tone drastically, while the expected boost in violence---though minor, by Miike's standards---punctuates the film's most gruesome development without feeling excessive. In almost all respects, this is a first-rate remake (regardless of the necessity of such a thing) that fans from both eras should appreciate. The tension builds nicely as a result of smart and dynamic pacing, excellent performances and mountains of Job-like personal tragedy. Hara-Kiri was the first 3-D film to be selected for exhibition at the Cannes Film Festival, but this added visual flair has not been replicated for Tribeca Films' domestic home video release. Available on Blu-Ray and DVD, the latter serves up a fittingly robust A/V presentation despite a lack of bonus features. Presented in its original 2.39:1 aspect ratio, Hara-Kiri's 1080p transfer looks fantastic from start to finish. The film's natural color palette holds up well with no bleeding (pun intended), black levels are strong and textures are crisp and defined. Digital imperfections such as noise reduction, edge enhancement and compression artifacts seem to be completely absent. Hara-Kiri has no shortage of visual strengths and this Blu-Ray presentation takes advantage of them all. Though it was exhibited theatrically in 3-D (to minimal effect, according to several reviews), this Region A disc does not replicate that experience. DISCLAIMER: These promotional screencaps are strictly decorative and do not represent this Blu-Ray's 1080p resolution. The audio is another highlight, whether you choose the DTS-HD Master Audio 5.1 or 2.0 presentations. Dialogue is crisp and easy to understand, Ryuichi Sakamoto's score adds occasional weight and the film's thrilling climax comes alive with strong channel separation. 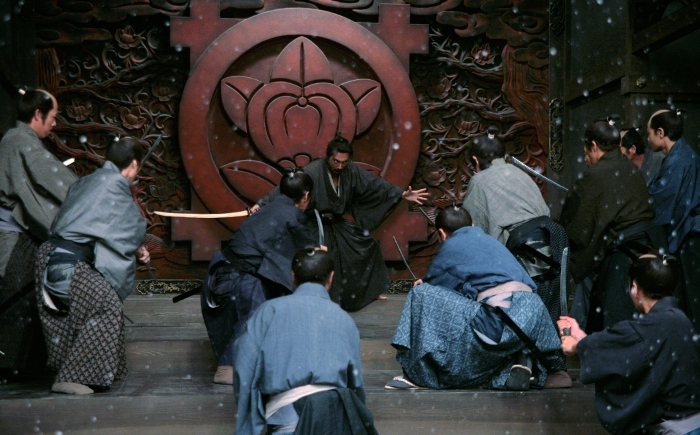 Hara-Kiri features a wide and immersive soundstage at times, though the film's understated first and second acts are more subtle than showy. Both audio tracks are presented in the original Japanese with forced English subtitles (white). The elegant menu interface combines smooth navigation and an attractive layout. This one-disc package is housed in a standard blue keepcase with one-sided cover artwork, no insert and a matching slipcover. Nothing but a brief Discussion about the film with Tribeca's Geoffrey Gilmore (1:46), which is obviously more promotional than anything else. What's the point of trying to sell us something we already have? Takashi Miike's Hara-Kiri: Death of a Samurai is a terrific genre effort, whether you've seen the 1962 original or this is your introduction. Featuring a wonderfully subversive story, strong performances, rich visuals and occasional bursts of action, samurai film lovers will undoubtedly enjoy themselves. Tribeca's Blu-Ray package serves up a strong A/V presentation but nothing in the way of extras. Recommended as a blind buy for both samurai and Miike fans, as long as they're not expecting a non-stop gore fest. Randy Miller III is an affable office monkey from Harrisburg, PA. He also does freelance graphic design projects, teaches art classes and runs a website or two. In his limited free time, Randy also enjoys slacking off, juggling HD DVDs and writing in third person.